Thank Goodness It's Stamp Free Friday! Hello! This month I am posting on Fridays once again on the PaperWorks Co. Blog. Fridays are Stamp Free Fridays, so I thought today would be a perfect time to use my new My Time Made Easy template called Barrow of Blooms~Love it!!! I decorated it with some pretty Echo Park Paper Co. Life is Good dp which you can find at the PWCO store HERE! I also made a tag using the PTI Tag Sale #4 Die once again, and used some alphabet sticker letters from the same Life is Good Collection. Isn't this a fun way to give a crafty friend a bag full of flowers! Also, my daughter and I are going on a road trip today and tomorrow, and hopefully I'll be able to show you the reason why on Sunday! We are so excited!!! This is the cutest thing ever! Fabulous project and have fun on your road trip! Awesome wheel barrow, so very clever and cute! Happy Mother's Day and have a great weekend! This is so adorable!! What a wonderful gift. Oh my word girly this is FABULOUS!!!!!!!!! I sooooooo love your project, absolutely ADORABLE!!!!!! I hope you have a wonderful Mother's Day sweetie! big hugs! OK, Kerri...you're keeping us in TOO MUCH suspense - lol! Guess I'll just have to wait and see what all you have up your sleeve besides your axilla! 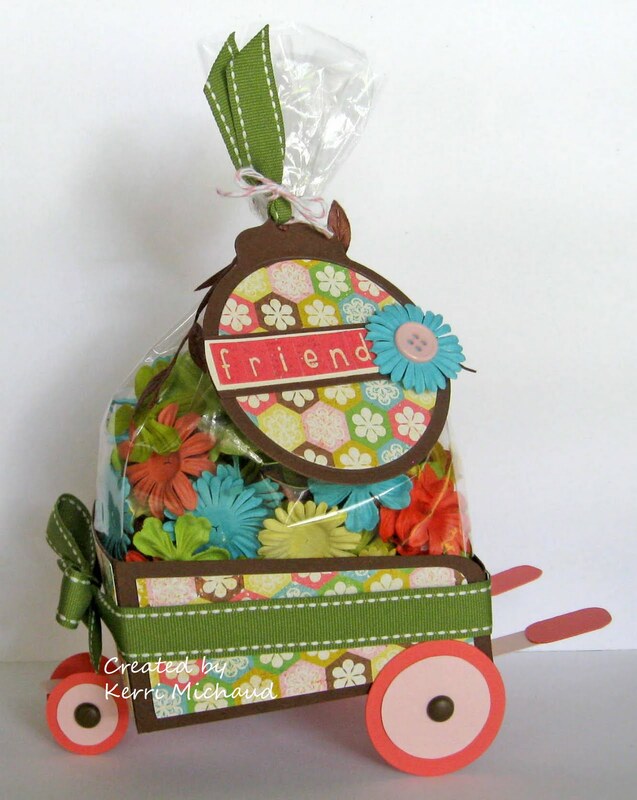 :-) LOVE this sweet little wheelbarrow...so cute! What a cute creation and awesome idea for giving a bundle of goodies! I saw this template this week and put it on my wish list. Now for sure I want it!! Yours is gorgeous!! I love every detail!! What a sweet wheelbarrow and all those flowers inside match the one's inside perfectly!! Beautiful creation girlie! !